There's no doubt about it — going through a divorce can be an emotionally trying time. Ironing out a divorce settlement, attending various court hearings, and dealing with competing attorneys can all weigh heavily on the parties involved. 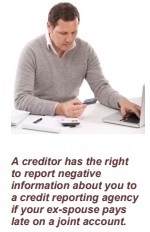 Review your credit report and check it for any inaccuracies. Are there joint accounts that have been closed or refinanced? Are there any names on the report that need to be changed? You're entitled to a free copy of your credit report once a year from each of the three major credit reporting agencies. You can go to annualcreditreport.com for more information. After a divorce, you'll want to change the beneficiary designations on any life insurance policies, retirement accounts, and bank or credit union accounts you mayhave in place. Keep in mind that a divorce settlement may require you to keep a former spouse as a beneficiary on a policy, in which case you cannot change the beneficiary designation.